General Atomics-Aeronautical Systems Inc. (GA-ASI, Stand R81) is scheduled to conduct a further demonstration with the U.S. FAA next month in Los Angeles, California, as it continues to progress on plans to bring a “certifiable” version of its medium-altitude, long-endurance remotely piloted aircraft (RPA), the MQ-9B, to market early in the 2020s. The demonstration will be the latest for the newest member of the Predator family in unsegregated and controlled airspace, following an Aug. 16, 2017 flight from Laguna Airfield at Yuma Proving Grounds, Arizona, through national airspace to GA-ASI’s Gray Butte flight operations facility near Palmdale, California. GA-ASI CEO Linden Blue had called the August flight “another milestone in our progression towards delivering an RPA system that meets NATO airworthiness requirements for [unmanned aircraft systems].” That flight, lasting 45 minutes and covering 275 miles, required FAA approval through various classes of non-restricted airspace, GA-ASI said. 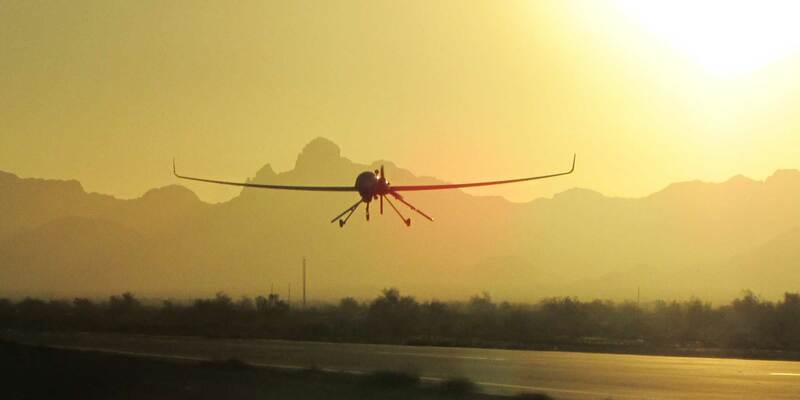 GA-ASI, working with U.S., UK, and international regulators to facilitate the use of RPAs in unsegregated airspace, says the MQ-9B is the first system of its kind that is developed specifically with international type-certification standards in mind. The new MQ-9B model is designed from the ground up to be certifiable for use in unsegregated and controlled airspace. “Unless you have established an engineering basis to develop the airworthiness approval, it will be difficult for RPAs to integrate into the airspace. We believe we have cracked that nut,” said Warren Ludwig, director of international strategic development for Australia, New Zealand, and Southeast Asia. GA-ASI is working with the International Civil Aviation Organization on drafts of appropriate standards for such integration, along with U.S., UK, and other regulators on the possibility. “This is groundbreaking work,” he said. The March trial will involve a three-hour demonstration in Los Angeles airspace. This effort will show “that the FAA is building up confidence and we expect that confidence to continue to grow,” Ludwig said. He believes the UK will be the first to offer certification for operations, and that could come in the early 2020s.The UK Royal Air Force (RAF) is the launch customer, ordering 16 of a weaponized “SkyGuardian” variant of the MQ-9B. To get to certification, GA-ASI not only is working with regulators on standards and regulations, but it also has designed the MQ-9B to incorporate a series of sense-and-avoid systems, including radar that is coupled with TCAS II, ADS-B, and IFF (identification of friend or foe). That information is “fused together,” he said and then can be transmitted to ATC and other aircraft “just like a normal manned aircraft.” If the link to a ground control station breaks, the aircraft will still be able to operate within civil traffic in a safe manner. “That’s been our design goal,” he said. Part of the development with the MQ-9B includes a redesign of system architecture to separate flight systems from mission systems. This will enable flexibility for plug-and-play technology and payloads, without affecting the “flight side” or the certifiability, he said. GA-ASI also has “ruggedized” the aircraft to withstand harsh conditions with anti-ice, deice, and lightning protection, among other systems. Launched in 2012, the MQ-9B is designed to be capable of flying for 35 hours with airspeeds up to 210 knots and to reach altitudes of more than 40,000 feet. The RPA in May 2017 flew for 48.2 hours, while configured in an intelligence, surveillance, and reconnaissance "clean wing" mode with 6,065 pounds of internal fuel, landing with 280 pounds of reserve fuel. GA-ASI is developing two primary variants of the MQ-9B: the SkyGuardian, for missions over land; and SeaGuardian, for missions over water. The company believes the SeaGuardian could be well positioned in Southeast Asia, which has vast areas of ocean. Ludwig said the MQ-9B could take care of the “dull and dirty” work of patrolling wide spaces, freeing manned maritime patrol aircraft for specific search targets or armed missions. While the UK RAF is the first customer for the SkyGuardian, both variants have received interest from a range of applications, such as humanitarian missions and disaster relief. The U.S. government has authorized the sale of 22 to India for maritime patrol. Ludwig said the company has a number of other customers in the wings, but first must work through government export controls. GA-ASI continues to explore new applications for its Predator family, most recently demonstrating anti-submarine warfare (ASW) capabilities on a Predator B through a U.S. Naval exercise on October 12, 2017. Ultra Electronics supplied a sonobuoy receiver and General Dynamics Mission Systems Canada supplied data processing technology, enabling the Predator to receive acoustic data from underwater targets and transmit that data to the RPA’s ground control station hundreds of miles from the target area via satcom. The ASW technology is well established in manned maritime patrol aircraft, but Ludwig noted that now, GA-ASI has demonstrated the capability to deploy that technology in the unmanned arena. This continues an effort of making such technologies as cost effective as possible by enabling them to be used on RPAs, he added. While still in the early stages, “we have proved the concept is feasible,” he said. GA-ASI would aim for having the technology ready once the MQ-9B enters service in the early 2020s. In addition to the newly certified Predator, GA-ASI has refreshed its Gray Eagle line, transitioning production in October to the long-range variant, the MQ-1C ER Gray Eagle Extended Range. Delivery of the Extended Range variant is on pace for delivery in the middle of 2018 following operational testing and evaluation in the next few months. While in Singapore, GA-ASI also is highlighting the smaller variant in the Predator family, the XP, which already has had success in the Middle East, North African, and South American markets. But GA-ASI also sees substantial maritime possibilities, equipped with electro-optical Infrared cameras and company’s Lynx Multi-mode Radar that is capable of all-weather, day/night wide-area search, and new Maritime Wide Area Search mode. To expand its reach in the Asia-Pacific region, GA-ASI has been looking to forge partnerships. The company already has a number in place, including the recent expansion of its participation in Team Reaper Australia, the memorandum of understanding for collaboration with Huneed in Korea, as well as a collaborative agreement with a government/industry consortium in Japan. Partnership negotiations “is a process we are going through in all of our target markets,” Ludwig said. While eyeing working to evolve the RPAs and their capabilities, GA-ASI also has been developing new technologies for the associated ground control stations. At Singapore, the company is bringing its new laptop-based Expeditionary Command and Control, or XC2, system. Ludwig said the XC2 “takes a large amount of functionality from our ground control functions and puts it on a laptop.” The system, he added, will include a range of automation features to reduce operator workload. The portable system, which he said will need export approval for international customers, can be adapted to a range of RPA platforms. The company believes it will be ready to roll out later this year.